Poll: When was the last time you went to a panto? 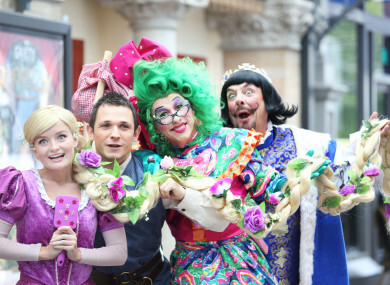 Stars of Rapunzel, this year's panto at the Gaiety Theatre in Dublin. THERE WAS A row brewing in the UK today over pantos and their place in modern society. It came after theatre bosses at the London Palladium removed a sketch where a male actor looked up a female character’s skirt. It led to Conservative MP Nadine Dorries claiming that “left-wing” snowflakes” were “killing comedy” and “dumbing down panto”. Ireland’s panto culture may be a little less risqué and more child-focused than in the UK, but pantos are still a big part of Ireland’s Christmas/New Year period. But do you go? Poll, When was the last time you went to a panto? Email “Poll: When was the last time you went to a panto?”. Feedback on “Poll: When was the last time you went to a panto?”.